GRID Alternatives is a mission-driven nonprofit solar installer with an innovative workforce development and community engagement model that integrates job training and tenant engagement into every aspect of our work. We make multifamily solar easy for affordable housing developers, tenants owners and operators. 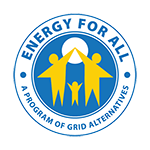 For over 15 years, GRID Alternatives has provided technical assistance and in-house solar design and installation services to affordable housing providers, city and county government agencies, and Native American tribes across the country. Our work includes directly securing funding and providing siting for solar projects with partners like NeighborWorks America affiliate organizations and housing authorities, as well as direct management of California's $162 million Single-Family Affordable Solar Homes Program and the Department of California Services and Development's $14 million Low Income Weatherization Program. Special thanks to The JPB Foundation for its generous support of our technical assistance services, and to Goldman Sachs for helping launch our multifamily program in 2014. *GRID Alternatives is a fully licensed solar contractor. Click here for a list of our current licenses. Reach out the the GRID office in your region to learn more.